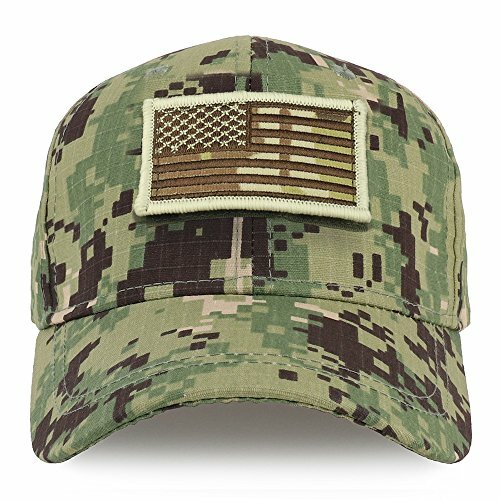 Our Trendy Apparel Shop Youth Military Camo Combat American Flag Patch Tactical Cap is perfect military style hat for your junior troopers. This youth size tactical cap features hook and loop patch on the front and back to allow for your own patches. Made of 60% Cotton and 40% Polyester. Structured crown. 6 panels. Mid profile. Stiff and pre-curved bill. 6 ventilation eyelets. Fitted with an inner sweatband. Finished with an adjustable hook and loop closure. One size fits most kids.